Manually scrolling through a document while reading can make your reading experience stressing, especially when you are using a laptop built-in mouse. 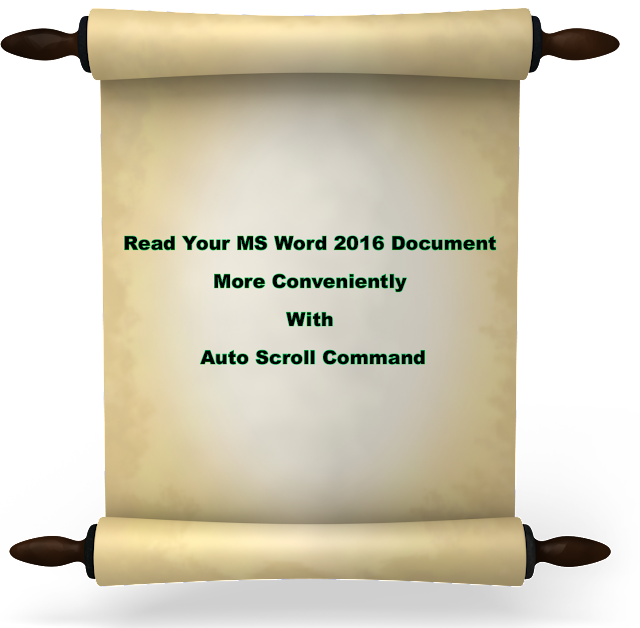 But there is good new, Microsoft Word 2016 support a feature that is called Auto Scroll. Once you activate this feature, your Word document will start to auto scroll itself at the direction you specify and at the pace you intend. So let us explain how you can using this feature in Microsoft Word 2016. Activating The Auto Scroll Feature. One thing you should know is that the Auto Scroll Feature is not a command that appears in any Command Group of the Ribbon, hence you have to add it yourself. To do this follow these step. 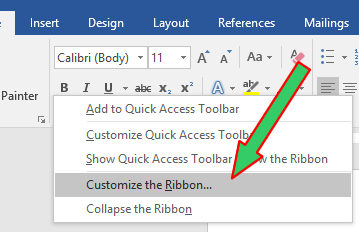 Right-click on any empty space in the Ribbon and select Customize the Ribbon... in the right-click menu. Then in the Word Options window, Select Commands Not in the Ribbon from the Choose commands from: option list and then select Auto Scroll in the box commands list below it. 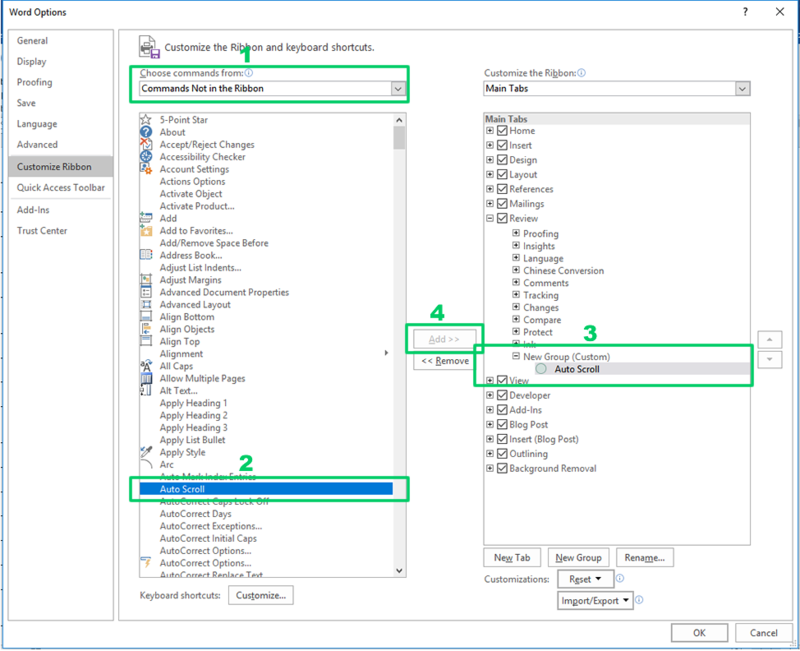 Next in the Customize the Ribbon: section expand the Review option which is in the Main Tabs box list, and Right-click and select New Group, to create a new command group in the Review Tab. (the reason is because, in this example, we will like the Auto Scroll command option to appear in the Review Tab. But if you do not want it to appear there, then you can choose any other Tab you prefer, but we recommend that you go along our example.) Now in the buttons between the Choose commands from: and Customize the Ribbon: section, click on the Add>> button. Finally click the OK button at the end of the Word Options window. Once you have added the Auto Scroll command to the Ribbon, then do the following to use it. In the New Group command section which will be the last command section to the right, click on the Auto Scroll icon. Once you do, the cursor will change to to having a up and down arrow head with a dot between the arrow head at the center of Word 2016 window. Move it down or up to start the Auto Scrolling direction. Note: the more to move the cursor away from the center, the faster the auto scrolling speed. To stop the Auto Scrolling, just press any button of the mouse or hit the Esc button of your keyboard.